We all know that diamonds are precious treasures…but did you know that they can also carry even rarer treasures within themselves? This is precisely what was discovered by Graham Pearson, a professor from the University of Alberta, during his time spent in the already-famous Cullinan Mine. The Cullinan mine, which produced a pair of some of the most famous diamonds in the world that currently reside in the British Crown Jewels, has now become known as a place of great scientific significance. Pearson’s find “provides fundamental proof of what happens to the fate of oceanic plates as they descend into the depths of the Earth.” The formation of the perovskite within the diamond indicates this, and also the fact that this diamond formed over 400 miles beneath the surface of the earth (most diamonds form only 100 miles down)! …Talk about performing under pressure. London is the place to be for lovers of the exceptional this winter. Recently revealed to the public in hopes that a private collector will do just that–collect–a very, very special stone which awaits its new home. The mode of sale currently underway, however, is rather unusual for this caliber of stone…typically, such a dazzling diamond would be put up for auction. Instead, Sotheby’s has daringly opted to quietly keep it available for private purchase. Whether it will sell immediately, or not to this generation, is unknown. But what we do know is that if you’re in London and have some spare time, maybe the Rosetta Stone can wait. Rough diamonds have never looked better…billionaire and diamond-specialist Laurence Graff just closed the deal on a perfect pair; two parts of the same massive diamond. After more than a year of deals, the dazzling duo were finally reunited after having been separated in May. These two massive rough diamonds, which would have originally been a single stone of 1,922 carats or more, fell apart during their collection from the earth into two pieces. The larger of the pair, the “Lesedi La Rona” diamond (meaning “our light” in the local Tswana language) weighs in at a whopping 1,109 carats, while its smaller sister is a still-substantial 813 carats. Both stones were confirmed to be type IIa, the purest and most exceptional quality a diamond can be. Though these pieces were uncovered nearly two years ago in November of 2015, it has been quite a journey for them to make it into the hands of their new owner. After an initial auction in June 2016, in which Lesedi La Rona remained unsold due to under-bidding (for a time it was suggested that the stone was “too big to sell!”), it finally went to Graff at auction this September for $53 million…a $17 million discount from its original asking price of $70 million! The “Cullinan” diamond before it was separated into the separate crown jewels. The stone itself is recorded as the second largest rough diamond of gem-quality to have been uncovered in history, the only diamond larger having been the famous “Cullinan” diamond which now resides in the crown jewels in London…Perhaps the second largest will also be fit for royalty, once it is finally cut and polished? We’ll find out! The new series will be celebrated on Saturday, April 30, 2016 from 1:00 p.m – 7:00 p.m. at the Eve J. Alfillé Gallery and Studio, and will allow guests to indulge in beverages, food, live music, and Evanston-made art jewelry. Evanston, IL – Get your walking stick and rucksack ready, because it’s almost time to traverse some terrain with Evanston’s resident citizen of the world, Eve Alfillé. This world-conscious creator has tackled fields ranging from history to language and more with her art jewelry, and is using her latest series to explore even more of the world she loves. The series, “Latitude & Longitude,” will be celebrated at the Eve J. Alfillé Gallery & Studio on April 30 by fans of jewelry and geography alike! No world capitols, no school quizzes! Alfillé’s exploration takes us back to the physical world, and how we learned to relate to the space we inhabit and the lands and seas beyond. Each place, both familiar and foreign, will be evoked with materials ranging from pristine diamonds to baroque pearls to unruly fossils that celebrate the world in all its textures…wavy seas, grainy sands, and more will have a place on Eve’s map. Sterling silver and garnet “Rose des Vents” earrings could be yours…enter Eve’s raffle and see! Symbols will also be key: a compass rose, a pendulum, birds in migration, the fish of the seas, along with a circle of ebony to represent the unity of the earth and all things in it. Above all, Eve stresses the importance of solidarity in a world with as many varied passions and opinions as there are latitudes and longitudes. The opening celebration promises to be worth the trip– tantalizing treasures await, including a raffle for a stunning necklace and pair of earrings designed by Eve just for the party (no purchase necessary!). Come test your luck at the raffle, or simply enjoy the party atmosphere with a glass of Champagne! Festivities will also include delicious catered treats by Donna Goodman and musical stylings of jazz duo, The Casual Flyers. All earthlings are invited! The new series will be released and celebrated on April 30, 2016 from 1:00 p.m – 7:00 p.m. at the Eve J. Alfillé Gallery and Studio. To ‘book your trip,’ send us your RSVPs at 847-869-7920 or by email at contact@evejewelry.com. To learn more about Eve Alfillé and her inspiration, go to www.evejewelry.com. An illuminating discovery was unearthed only weeks ago in Angola, Africa, unexpectedly escalating the shares of the company responsible by 29 percent. 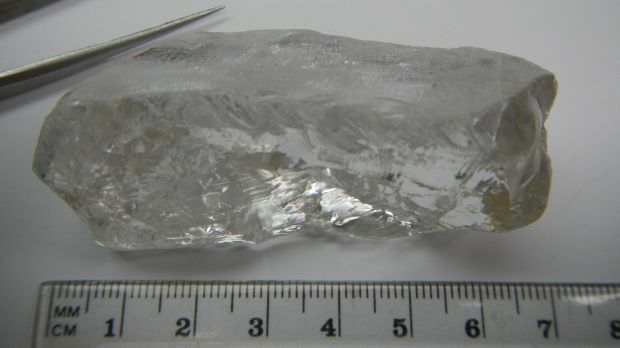 Lucapa Diamonds, an Australian-based mining company, was already in the public eye following the recent discovery of three other diamonds over 100 carats from their Lulo mine in recent history. The uncovering of a diamond of spectacular proportion, however, broke all of these records: a 404.2-carat behemoth of a diamond was found, sporting a top-tier D-color and Type IIA. The stone itself measures about seven centimeters in length, which would be comparable to wearing a diamond ring the size of your finger itself. While the final fate of the gem is unknown, it caused a stir at market when the stone sold for $22 million Australian dollars, or roughly $16 million in the US. That’s quite a bit of change, with an estimated $55,585 per carat! This stone is currently measured as the 27th largest recorded diamond in history, following such illustrious diamonds as the Cullinan diamond found in South Africa in 1905…And if rare stones such as these are your fascination, there are many minerals far more rare than diamonds! Keep an eye on the blog in the coming weeks to possibly read about them in a future story.